"Lizard sings a beautiful and catchy song about his house, the rock. 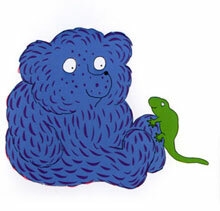 When bear hears the song, he loves it so much that he asks Lizard to teach it to him. Lizard teaches it to him, but Bear forgets easily and after a whole day of teaching and forgetting due to various situations in the forest, meadow and lake, Lizard falls asleep and doesn't stir when Bear begs him to sing the song once more. Bear takes Lizard home in a sack. When Lizard awakes, he teaches Bear the song again, but this time it includes Bear's own house, the cave. This word-for-word reading of the book by George Shannon, translated by Aida Marcuse, is read in Spanish by a male narrator who speaks clearly and evenly and who creates enjoyable vocal characterizations for the various animals. This would be a welcome addition to Spanish language materials in all libraries."